Do wind and fruit go together? We’ve had some mighty winds over the fruit season. We live in a very windy spot here on Mount Alexander – it can often be completely still in the valley below us, but blowing a gale up here on the farm. Wind has a bit of a bad reputation when it comes to fruit trees, and is often blamed for fruit ending up on the ground. But in fact, it’s often only the ripe or over-ripe fruit that ends up on the ground, or fruit that wasn’t very healthy and was destined to fall off anyway. Now it’s quite annoying if the fruit you were about to pick in a couple of days hits the deck, where it often splits, or becomes rapidly full of ants and other critters, so it’s a very good idea to monitor your trees frequently when it’s getting close to the time you expect to pick the fruit. Lots of varieties need picking multiple times (we pick some varieties four times over a few weeks, just getting the ripest fruit each time), so it’s worth casting your eye over your tree every day or two, and picking just those bits of fruit that are ripe. That way you’ve got a good chance of getting them before wind does. Wind does have some advantages though, particularly in rainy weather, when it helps your trees dry quickly. The dreaded brown rot fungal disease will only take hold in your trees if they are wet for long enough, at the right temperature, so wind can definitely be the fruit grower’s friend. If you’re planning to plant fruit trees, or are making changes to your garden, take the wind into account, and try to choose (or create) a microclimate that will allow good air movement around and through your trees. 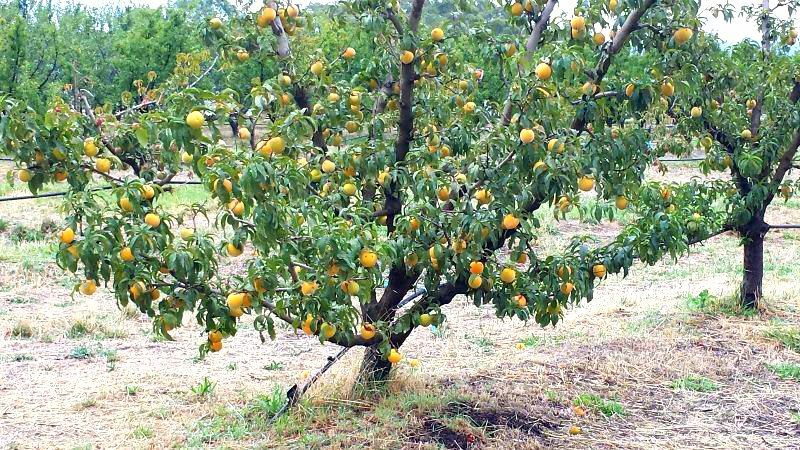 Also make sure your fruit trees are pruned in an open shape to allow the wind to easily get in the middle and dry them quickly after rain, and make sure any windbreak you plant won’t create a completely still environment for your trees. Choosing the right time to pick your fruit can be tricky, and is one of the mistakes new growers often make, either picking fruit too green (so it doesn’t taste very good, and won’t ripen off the tree) or too ripe (which can also result in loss of flavour and failure to store well). However it’s not that hard once you know what to look for, and get to know your trees. Luckily each type of fruit has a bunch of different indicators to guide you, which you can learn about in detail in the short course “Fruit to be Proud Of“. Hi Paula, what a pity for you, after all your hard work. The solution is probably in fruit thinning – did you do that this season? We recommend never leaving more fruit on any branch or lateral than it can bear the weight of – for this exact reason. If the broken branches are still attached you can try reattaching them – try to match up the split as tightly as possible, and then bandage/splint or do whatever you need to do to hold them together and see if the branch will re-heal. They often will, but if the wound is too big then best to remove it completely to reduce the risk of further tearing. No problem doing it in the heat, it will just help the wound to heal. Next Next post: A bit of resilience….